The Bent Press is an exercise everyone should be incorporating in their training, it’s awesome for so many things. It’s also great to get heavier weight overhead and focus on the down-phase of the overhead position, i.e. increase your pressing strength. When I say everyone I mean every, it’s great for people who sit behind the computer all day, it’s great for Crossfitters to improve overhead mobility, shoulder strength and much more, it’s great for Brazilian Jiu Jitsu practitioners, not much to be said other than drop the word ROTATION. Above all, good thoracic mobility will help prevent injury, i.e. a stiff thoracic spine will require you to employ other areas less suitable for certain moves, and creating potential for injury. One can come under the weight in different ways, one leg locked other bent or bending both knees and turn it more into a squat under. I know this exercise looks cool and you’ll probably want to grab a heavy weight right now and try it out, DON’T! … unless you’re already conditioned in this area, do not attempt this move straight away, it require progression, work on your flexibility first, hamstrings especially, work on shoulder strength first, work on rotation with just bodyweight, work on the movement without weight, then slowly increase the weight over time. PS. fun fact, the photos for the cover image were taken during an 11 hour hike up the mountain in Nerja, middle of summer, we carried these babies through the water, over the waterfalls, on the top of the mountain. Got some great stories for this hike. On that note, I can be employed to organise any type of adventure on the Costa del Sol, BJJ, CrossFit, Kettlebells, mountains, hiking, cycling, challenges, walks, you name it. From light to extreme. 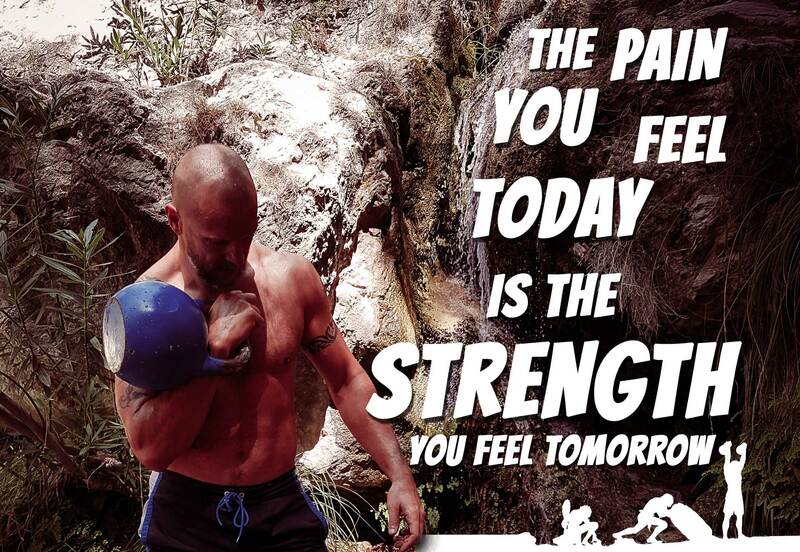 www.fitnessbreakbootcamp.com or contact me on Cavemantraining.